Previously I've written about running the AAISP FTTC service on OpenWrt with Routerboard RB450G to be able to get native IPv6 and comprehensive firewalling. Changes in my plans means that being able to run wireless links from the edge router is a big advantage now and the RB450G is a cable/ethernet router, hence switching platforms to one with built-in wireless. After lots of research I settled on the Netgear WNDR3700 v2 for having gigabit ports all round and dual-band wireless. It is not up to the same level on memory, but adequate for most uses (ie. no heavy applications in the mix). A bonus is that they come up on eBay periodically for not a lot of money so having a spare on hand for any problems is negliagable extra cost. This is trivial with the pre-built image for the WNDR3700v2 available. Download the openwrt-ar71xx-generic-wndr3700v2-squashfs-factory.img image and simply load it as you would a regular fimware update through the web interface of the router. There are de-bricking instructions on the OpenWrt site, but I've not had any problems so never needed to try this. To access this I connected a laptop with DHCP to the LAN ports on the router and telneted to 192.168.1.1 and set the password with passwd. After that ssh is enabled and you can continue using that and the LuCI web interface. For simplicity I use LuCI for most configuration and it's improved loads since prvious version so stuff now "just works". At this point you can go ahead and configure the network. I've left the basic setup with the br-lan bridged network between Ethernet and wireless. 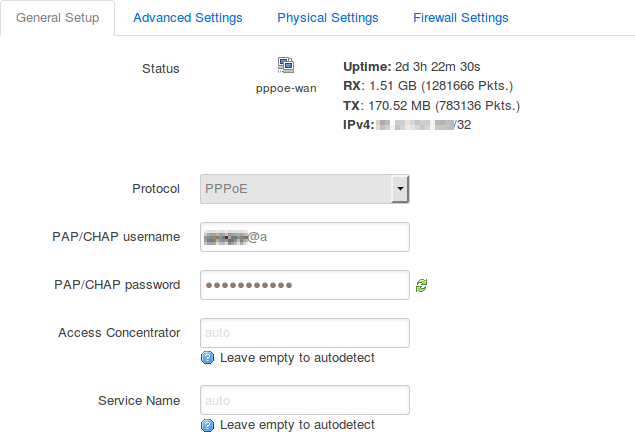 I've removed the wan6 interface since this is not needed with the native IPv6 from AAISP. 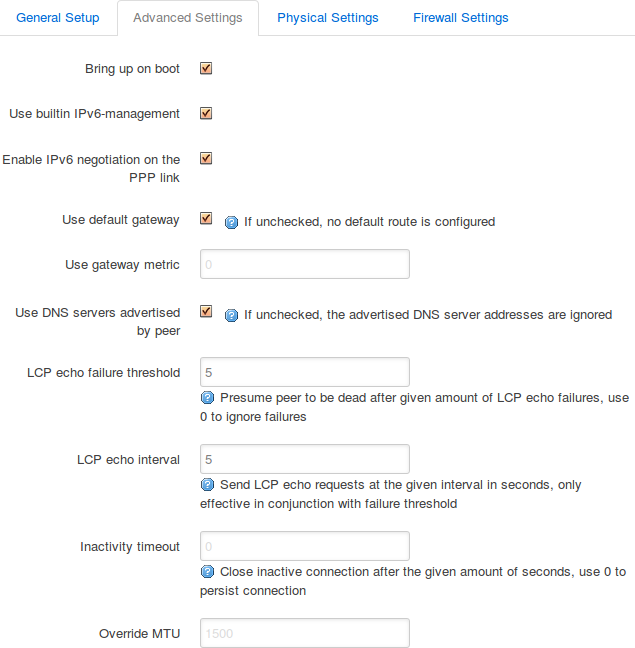 I'm using a no-NAT setup, but you can vary the setup for your requirements. At this point IPv4 data should work, but after much head-scratching about why IPv6 was not working I came to the conclusion that it's not longer setting an IPv6 default route for the PPPoE link as it was in previous versions. The solution seems to be to do something similar to what is on AAISPs Wiki about setting this up on Linux and create a hotplug script to set the route when needed. route -A inet6 add default dev "$DEVICE"
When the pppoe-wan interface comes up now it will set the IPv6 default route to that which makes IPv6 work for me. This is largely the same as before - things to think about to make the router more secure. Previously I locked this down, however since you need to take the router apart to get to this and make up an adaptor, I haven't bothered this time. If someone wants to go to that extent of actually messing with hardware there are far worse things they can do, so physical security is really the key thing this time round. An important bit is to get a firewall setup. This can be done through LuCI or the shell as always, however if like me you need something more complex then /etc/firewall.user provides a shell scripting option. I've customized mine extensively with over 500 lines of code which processes my own format of rule sets as well as a bunch of sub-scripts which are included for flexibility when configuring the rules and behaviour for both IPv4 and IPv6. Another thing I discovered was that I was getting a lot of backscatter (presumably from others faking source addresses with mine) of ICMP type 3 and TCP with SYN and ACK set, and the firewall was letting these straight through. Fortunately I have multiple layers of firewalling and logging enabled. This hadn't happened on previous OpernWrt versions and a bit of digging turned up that nf_conntrack_skip_filter is enabled by default in the current version to save on resource usage.... well, I've decided I prefer to have clean firewalling that I know is safe so I've disabled this. My full script is way to complex to share - if you are doing stuff like that then no doubt you will already be intimately familiar with iptables/ip6tables, IP networking and not need an example to work from. For most people I'm guessing LuCI is probably the way to go, but the option is there if you require something more heavy duty. As before, I deploy a load of extra things to make everything work smoothly. Adaptions from before for the WNDR3700v2 are here. I use Dirvish (rsync based) for backups. To be able to use ssh key authentication for this either add the key in /etc/dropbear/authorized_keys or via LuCI in System->Administration. This also requires installing rsync (automatically adds libpopt). This brings the backups online and the entire system can be backed up like this. I run email notifications when events occur (potentially bad ones) on the WAN interface. For these we need to be able to send mail and I used mini-sendmail which will need installing before these can be used. The /etc/ppp/if-*.d/ scripts are deprecated in Attitude Adjustment, preferring instead to use /etc/hotplug.d/iface/ scripts so I have updated and adapted my previous scripts for this. This simply emails on Interface up or down events. Configure the variables for mail servers etc. before use. Sometimes faults occur where DSL connections get switched to BTs test connections which are to a private test network. This basically means all internet connectivity is lost and until the connection drops or resets the router remains happily connected to an unusable service. If I'm away from home that means an awful lot of downtime could result so this script takes care of it automatically and both emails and restarts the WAN interface if the expected (static) WAN IP address isn't present. Again, configure the variables for mail servers etc. and the expected IP. If you are with another ISP which uses dynamic addresses then you will need to tweak this script to pattern match rather than use a fixed IP. Previously I provided scripts and templates for Cacti to monitor the router. Little has changed however there have been various improvements and an update to work with uhttpd rather than the busybox httpd. Unpack these in /www/cgi-bin/ and they should go into monitor/ providing various monitoring data via http. If required access to these could be locked down further, however as they take no input and are only served on the LAN (by config above) currently they are left open. We are still using largely the same Python Input Scripts for Cacti to collect the data. These should be unpacked into /usr/local/share/cacti/scripts on Debian based systems otherwise where is appropriate for your system and adapt the templates to match. Plus we have a improved Template. This needs settings updating and then can be run from CRON as often as you want with an appropriate entry in /etc/crontabs/root or via LuCI in System -> Scheduled Tasks.